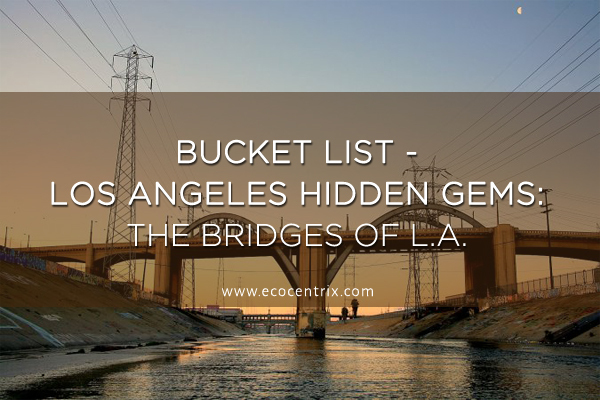 Bucket List – Los Angeles Hidden Gems: The Bridges of L.A. In our previous blogs about the hidden architectural gems of L.A., we talked about buildings that, although stunning and architecturally significant, are often overlooked by the average person. They are rarely sought out, generally only found by the curious who really have an eye for architecture and art. Of course, buildings aren’t the only kind of architectural gems. What about bridges? Millions of these architectural marvels are littered across the landscape of America, seen and used every single day, but rarely a thought is ever spent on them. Even in my earliest memories, I’ve been fascinated by bridges. I believe that they represent some of the finest and most honest expressions of architecture and engineering that humankind has ever produced. Some of the best known scenic icons in the world are bridges. I fondly remember participating in a marathon both ways across San Francisco’s Golden Gate Bridge, feeling it bounce and give under the stress of the cadence of several thousand fellow competitors. Driving across the (seemingly never-ending) 24-mile long, low lying, Causeway that spans Lake Pontchartrain in New Orleans was yet another vastly different experience! In their many forms and styles, bridges serve as more than merely functional and useful structures, they are iconic works of art that exist all across the United States. Los Angeles and its surroundings are no less adorned by these fabulous monuments to architectural skill and ability. They may not rank among Santiago Calatrava’s inspiring contemporary feats or be considered national landmarks, but they do shape the vernacular of my native L.A. Here are a few of my favorites, followed by a partial list of some major L.A. area bridges. Ok, I am cheating here a bit, as the Sixth Street Viaduct (pictured above) was torn down in April 2016 (also, it technically wasn’t a bridge). But fond, lingering feelings about the former structure have stuck with locals and visitors alike since its demolition. You may have recognized the Sixth Street Viaduct/Bridge from numerous movies and TV shows, like Terminator 2, Anchorman, The Dark Knight Rises, and, in its last big-screen appearance, Fast & Furious 7. For almost 85 years, it connected the Boyle Heights neighborhood with the Arts District in Downtown Los Angeles. Due to concerns about its structural integrity, especially during an earthquake, the decision was made to demolish it. Thankfully, a newly designed replacement bridge will begin construction in just a few months and will hopefully be completed in 2019. I look forward to seeing the new bridge and hope that it will live up to the legacy of its illustrious predecessor. Built in 1912, this 106-year old bridge spans Arroyo Seco in Pasadena. The bridge itself is absolutely stunning, spanning 1,386 feet with a max height of 150 feet. Because of earthquake damage, the bridge was substantially retrofitted in the early 90s to make it safer for future generations. It’s honestly a sight to behold. Unfortunately, the Colorado Street Bridge is more colloquially known as the Suicide Bridge, due to a large number of jumpers during the Great Depression. In later years, the balustrade of the bridge was replaced by an 8-foot tall barrier that unsuccessfully prevented more deaths over the decades the bridge has stood. Sadly, the nickname of the Suicide Bridge seems to be stuck for good. This 1,500-foot-long suspension bridge is probably one of the best known in L.A. It links San Pedro with Terminal Island, spanning the Los Angeles Harbor. If you had to describe it to someone unfamiliar with Los Angeles, you could say that it looks like the Golden Gate Bridge’s stubbier, greener little brother (a description which in no way describes the true beauty of this bridge). It’s said that the Vincent Thomas Bridge was a structure ahead of its time, as when it was built in 1963, it was known as the “bridge to nowhere”, as Terminal Island had not yet been extensively developed. This also makes it the youngest bridge on this list! Formerly a toll bridge, today there is a sign at the eastbound entrance stating that it is “free direction”, meaning you can drive across for no charge. Even those unfamiliar with L.A. might know the 1st Street Bridge, at least by sight. Built in 1929, this ironic bridge connects Downtown L.A. with Boyle Heights and is one of the most filmed locations in the city. If your movie or TV show is set in L.A., one shot of this bridge will tell your audience everything they need to know. After extensive retrofitting between 2009 and 2011, that included a Metro light rail extension across it, the bridge is now rated to withstand a 7.0 earthquake. Honestly, this short list cannot possibly sum up everything I have to say about bridges in Los Angeles. I could go on about them all day (making for a very long blog post), so instead, I will leave you with a list of some of my other personal favorite bridges in L.A., every one of them a hidden gem in plain sight!